North Carolina attorney-turned-author John Hart had a meteoric rise to kickstart his writing career; earning an Edgar nomination for his first novel, KING OF LIES, before winning the whole shebang with his sophomore effort, DOWN RIVER. If that wasn't enough, his third book, THE LAST CHILD clean-swept both the Edgar Award (making Hart a rare dual winner) and the CWA Ian Fleming Steel Dagger. In THE LAST CHILD, Johnny Merrimon is a thirteen-year-old boy who looks ten but has seen and endured more than most sixty-year-olds. His twin sister disappeared a year ago, his father cracked under the pressure and left, and his mother has given up; turning to drugs and a relationship with a rich but abusive man. A burnt-out cop tries to help but has his own issues, and Johnny finds himself alone on a vigilante mission. Then another young girl goes missing, and a dying man’s last words fuel Johnny’s long-held hope. Sometimes when I read a novel that has received so much praise, I can be left a bit underwhelmed, even if I enjoy the story. It's almost as if the expectations are raised too high, and the author has to knock it far out of the park to even make par (okay, mixed sporting metaphor there). 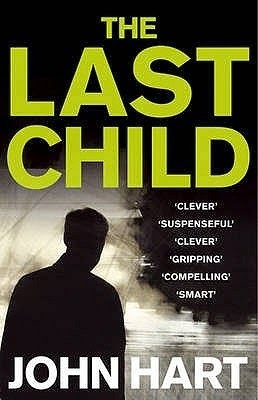 But put simply, THE LAST CHILD is an exceptional novel; a literary crime thriller that is as much about its rich cast of layered, authentic and damaged characters as its intelligent and engrossing storyline. Hart writes beautifully, evoking aspects of the human condition alongside echoes of the Southern Gothic tradition, building his tale towards a surprising yet most fitting conclusion. Huckleberry Finn meets James Lee Burke, all in a strong and unique narrative voice. THE LAST CHILD is a masterpiece, and Hart deserves all the acclaim he’s received.